Image: Martin Lawrence Bullard for Schumacher. If the thought of wallpaper strikes both excitement and terror in you, you’re not alone. 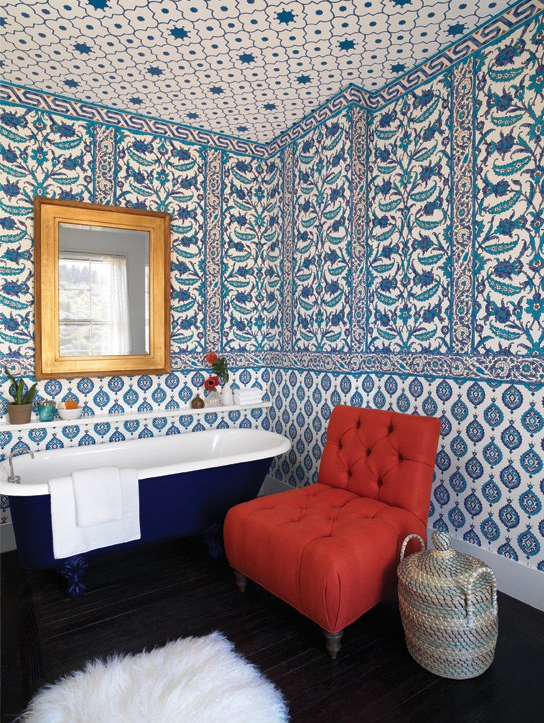 Wallpaper is an outstanding way to accent a room and, although it had a reputation for being difficult to apply and remove, has come ahead in leaps and bounds in recent years. Wallpaper has gone in and out of fashion in interior design, at one point replaced by narrower decorative friezes and the feature walls of the early 2000s. It is now, unquestionably back in and the great news is that with its resurgence has come a new wave of options and innovation. Vinyl-coated paper: This type of wallpaper is a paper surface with an acrylic coating for the design/colour. Useful in any area, these papers are hard-wearing and washable. Fabric-backed vinyl: Fabric-backed vinyl papers are available in solid vinyl, which has a coated surface and is the most durable wall covering and is ideal for washability. String effect: Fine vertical threads are laminated over the paper. These threads can be natural fibre such as silk or linen, or of a synthetic material. The result is stunning but delicate. Flocked wallpaper: Shakes of very fine cotton are added in a pattern over the base layer of the paper, giving it a textured 3D affect. These papers are also delicate and require a lot of care when cleaning. Natural fibres: Vines, jute, wool, seagrass, cork, hemp, sisal, cotton and grass can be dyed and laminated to a wallpaper backing for a naturally textured wall covering. They are ideal for living and dining rooms but can require specialist cleaning. Foils: Foiled papers have a luminous quality created by laminating a thin sheet of aluminium foil to the backing paper. Cork and cork veneer: Cork wall covering can create a striking affect in the right situation, giving a room a warm, natural feel. It’s also a great sound absorber and insulator. Cork is shaved from cork plants or blocks and laminated to the backing paper to create a user-friendly wall covering. Now that you are armed with information of various paper types, the fun part can begin. Patterns, plains, textures, the designs are endless and can even be custom made. Even if you want a wallpaper with your initials in it, or based around a child’s drawing, it is possible. The possibilities are endless! Then, once you’ve decided on the right look for your home, the fuss-free option for wallpaper application is to leave wallpaper application to the professionals, and this is our recommended method. A professional will leave a seamless finish, trim around any fixtures perfectly and ensure your wallpaper looks flawless. If you’re considering wallpaper for your home, Beadles interior design can help you create the perfect look. Visit us at our showroom to look through the hundreds of options available or call us for an in-home design consultation.